A 35-year-old female presents with fatigue. 1. What is the main abnormality? A 41-year-old female intravenous drug user presents with fever and cough. 1. 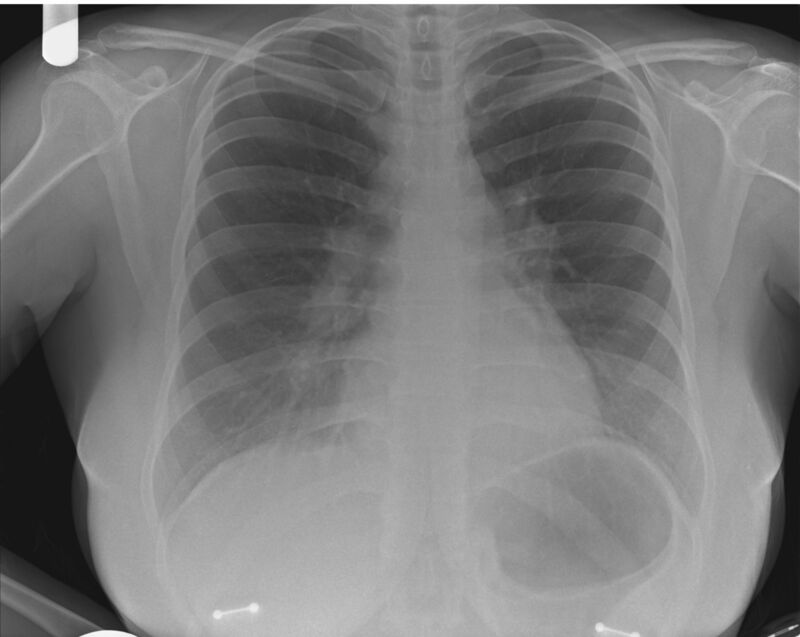 Which of the following is the most probable cause for these radiographic appearances? 1. d) Lymphadenopathy. There is bilateral hilar lymphadenopathy in this patient who was diagnosed with stage 1 sarcoidosis. In addition, there are enlarged nodes within the aorto–pulmonary window and right paratracheal region. Sarcoidosis Typically results in bilateral symmetrical involvement of hilar and paratracheal nodes. Tuberculosis Usually unilateral and associated with ipsilateral parenchymal disease. Lymphoma Typically results in bilateral asymmetrical lymphadenopathy and frequently affects the anterior mediastinal and retrosternal nodes. Neoplasia Due to nodal disease spread. Most commonly primary bronchogenic carcinoma, usually unilateral and can be very extensive with small cell carcinoma. Also occurs with nodal spread from other primary cancers including oesophagus, breast and thyroid. 1. b) Pulmonary tuberculosis. The main abnormality is the presence of multiple small miliary nodules throughout both lungs (blue arrows in the figure) due to military TB. There are also areas of more confluent consolidation and air space opacification in both mid-zones also consistent with pulmonary TB infection. 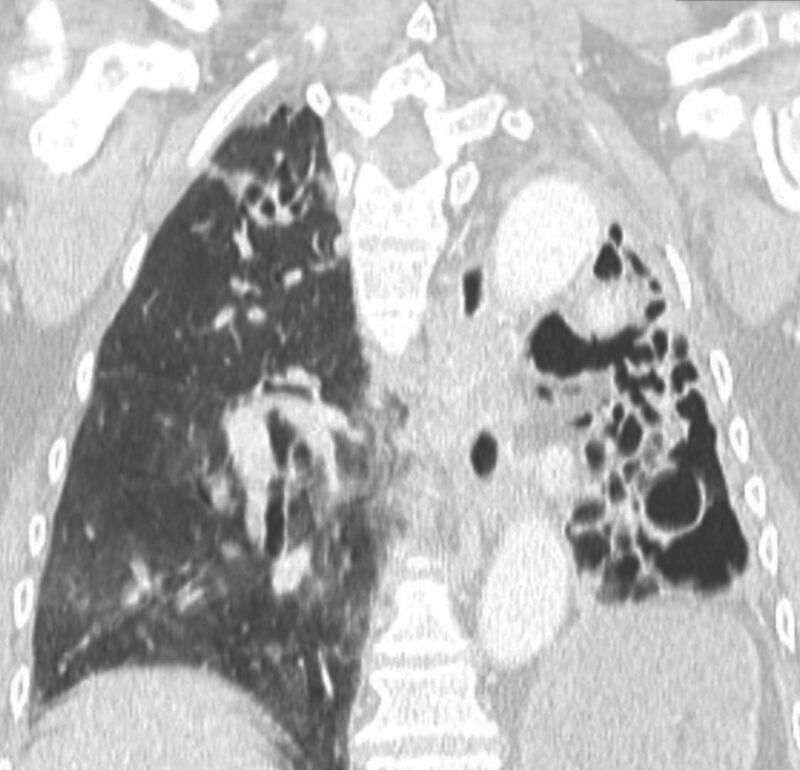 The multiple small pulmonary nodules were confirmed on a subsequent axial computed tomography (CT) with a selected image provided in the figure. Although pulmonary infarct is a possible cause of the bilateral areas of airspace opacification it is not a cause of multiple small military nodules. The differential diagnosis for miliary nodules includes: tuberculosis; metastases (most commonly thyroid carcinoma); fungal infection (histoplasmosis, coccidiomycosis); sarcoidosis; histiocytosis X (early active stage); or hypersensitivity pneumonitis (usually softer ground-glass nodules). A 42-year-old male with a CD4 count of 130 cells⋅mm−3 presents with shortness of breath. A 63-year-old male presents with chronic cough. 1. What is the most likely cause for these appearances? 1. c) Bilateral increase in lung parenchymal density “ground-glass” opacification. There is bilateral ground-glass opacification predominantly in a perihilar distribution. Note that the perihilar vasculature is indistinct. This was confirmed on a subsequent high-resolution CT (HRCT) performed for further assessment. 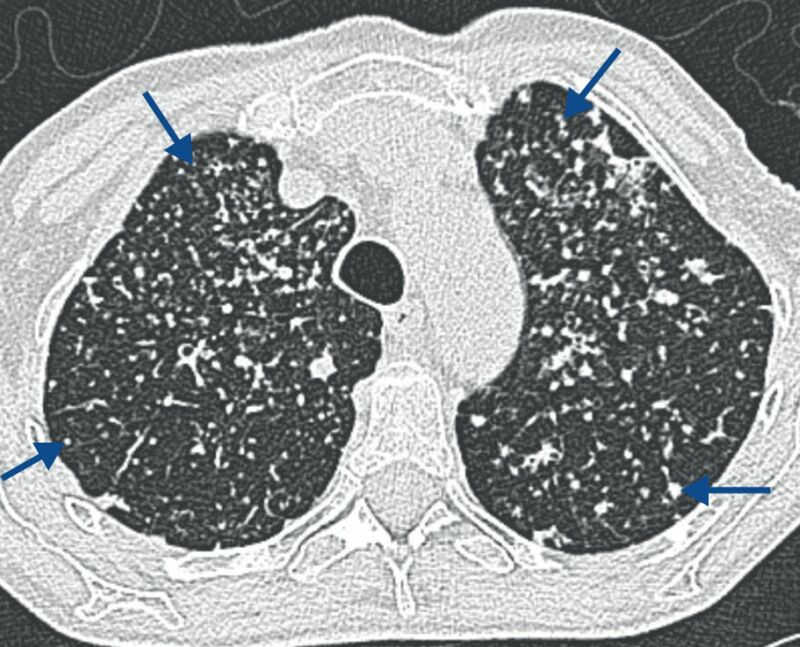 On the HRCT image, note the hazy increase in density of the lung parenchyma (blue arrows) in keeping with “ground-glass” opacification. Unlike “ground-glass” opacification on a chest radiograph, the ground-glass opacity on HRCT does not obscure the pulmonary vasculature. 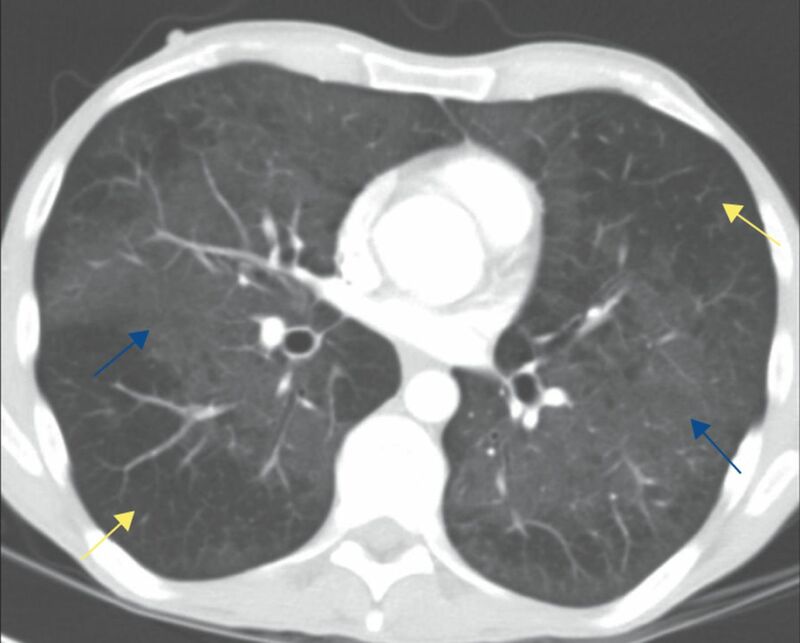 In this case, the presence of normal (yellow arrows) and abnormal lung (blue arrows) is easily appreciated, but it there is uncertainty as to the presence of ground-glass opacification, comparison of the attenuation of the lung parenchyma with air in the bronchi will aid detection – this is known as the “black bronchus” sign. The mechanism behind the pattern of ground-glass opacification is due to the displacement of air. This may be due to a number of factors including airspace filling and/or interstitial thickening. In this patient, who was immunocompromised due to HIV infection, the most likely diagnosis is that of infective pneumonia due to Pneumocystis jirovecii (formerly known as PCP pneumonia). 1. c) Previous tuberculous infection. 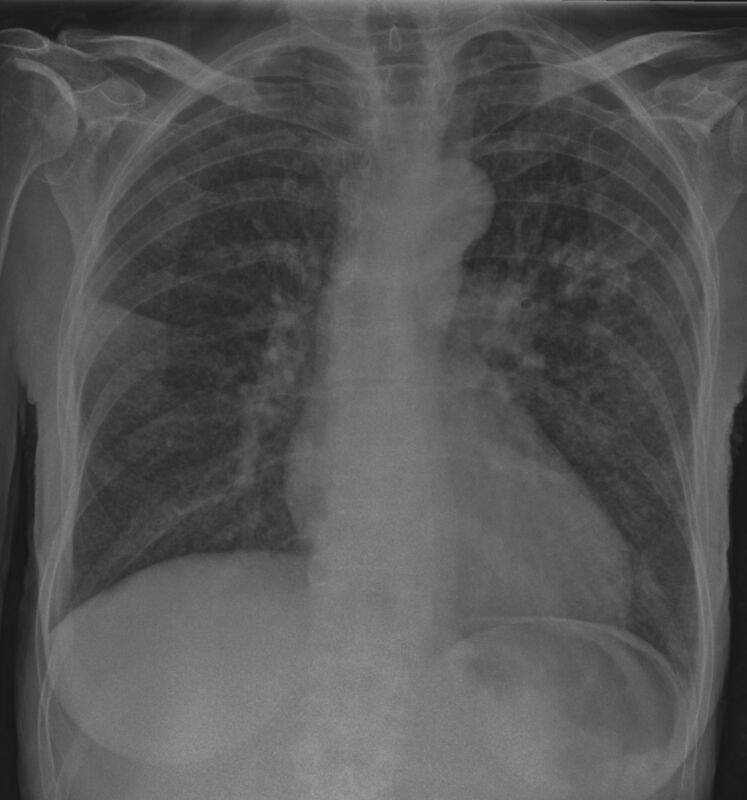 The main abnormality is the loss of normal lung architecture in the left hemithorax with multiple cystic lucencies. In addition, there is marked volume loss – note the tracheal and mediastinal shift. There is marked pleural thickening, which is best appreciated at the apex. The patient had developed marked fibrocavitary change secondary to the previous tuberculosis infection. A selected coronal image on lung window settings is provided from the same patient. 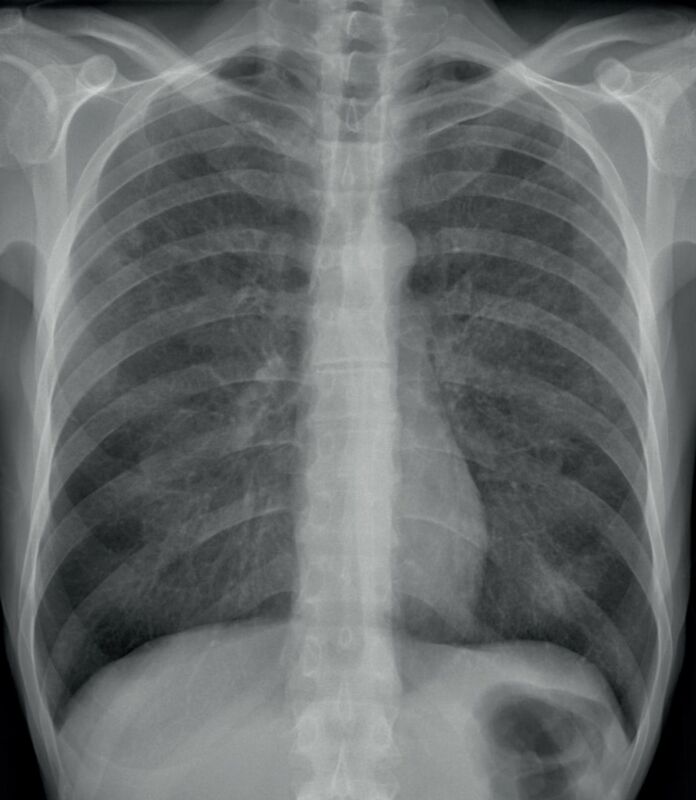 This also shows more localised bronchiectasis along with apical pleural thickening at the right apex which, although present, is less easily appreciated on the chest radiograph. 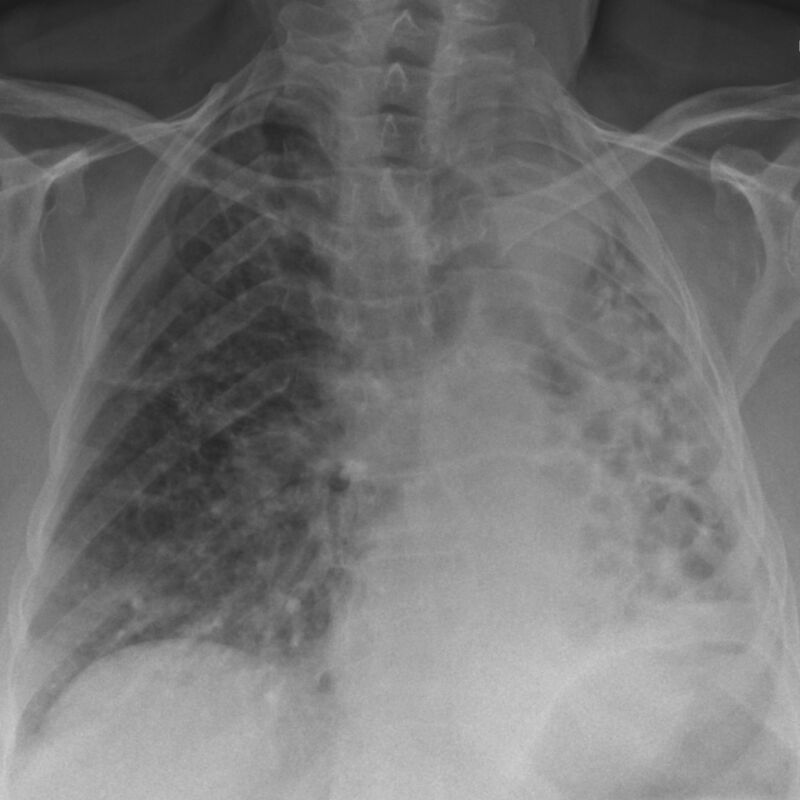 Post-radiotherapy change does not usually involve the whole lung, allergic bronchopulmonary aspergillosis causes a central bronchiectasis, but would not usually be so predominantly unilateral, and although there is volume loss the presence of extensive air-bronchograms goes against the diagnosis of a primary lobar collapse.